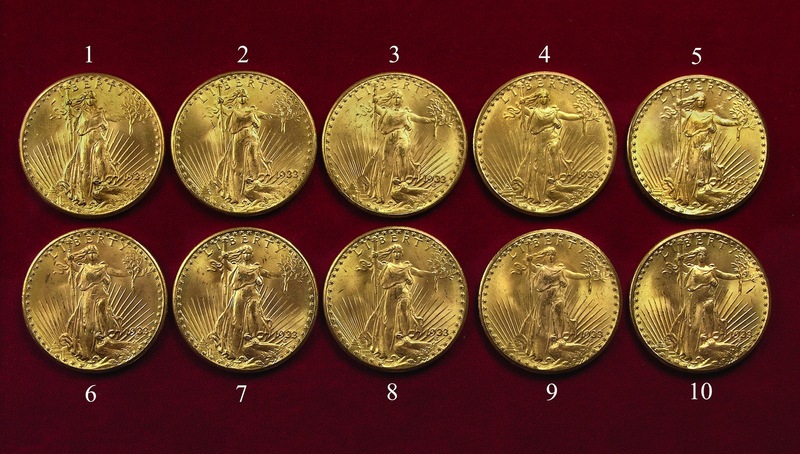 The ten 1933 Saint-Gaudens Double Eagles confiscated by the government from Joan Lanbord, daughter of Israel Switt. Coin World reported that the U.S. Mint knows about more 1933 Saint Gaudens Double Eagle gold coins in private hands. For those who have not read Illegal Tender by David Tripp or Double Eagle by Allison Frankel, aside from both being worth reading, they claim that 25 of these coins were illegally removed from the Philadelphia Mint. Of those 25 coins, nine were confiscated during the 1940s and 1950s by the Secret Service, ten are from the Langbord Hoard stored at the Bullion Depository at Fort Knox, and one is the Farouk-Fenton example which is the subject of the books. During the Pennsylvania Association of Numismatics (PAN) spring show, U.S. Mint Senior Legal Counsel Greg Weinman said that he knows where one is located in the United States, one is in Europe, and a third is somewhere else. The location of the last two is not known. It can be speculated that the “somewhere else” may be in Egypt. On February 8, 2008, the Moscow News Weekly reported that a version of the coin was found in Egypt in an old box that was owned by the discoverer’s father (web archive link). Although there had been a lot of speculation that coin might not be genuine, there has been no further reports as to the disposition of this coin. Weinman said that there are no plans to go after the three coins where the U.S. Mint knows their location. If the country is to be vindicated and the government has consistency in its argument that the coins are “chattel,” according to Weinman, then it is their legal obligation to have the U.S. Secret Service pursue the three known examples. Otherwise, it could be said that the government has undergone selective prosecution and has given up its right to the ten in its possession or the five that are still in public hands. It is these inconsistencies of policies with regard to these coins that could drive collectors away. While most people may never find or own one of these rare coins, what happens to those who might get lucky. While the 1913 Liberty Head Nickels were not considered chattel because they were never struck for circulation, the government fought the finding of the 1974-D Aluminum cent forcing its return. The circumstances for the striking of both coins are similar but the government has treated each issue differently. This is not a matter of integrity of the hobby. It is the integrity of the U.S. Mint and their bogus argument of what is or is not something they produced for whatever the reason. The integrity of the U.S. Mint can be questioned when they applied 21st century operating standards to the U.S. Mint of the 1930s in order to convince a “jury of peers,” none of which probably had a numismatic background questioning their ability to be peers, that these coins belonged to the government for it to hold like some almighty savior of us from the depths of fraudulence. Do you still feel vindicated?